114 p., 15,5 x 23,0 cm. 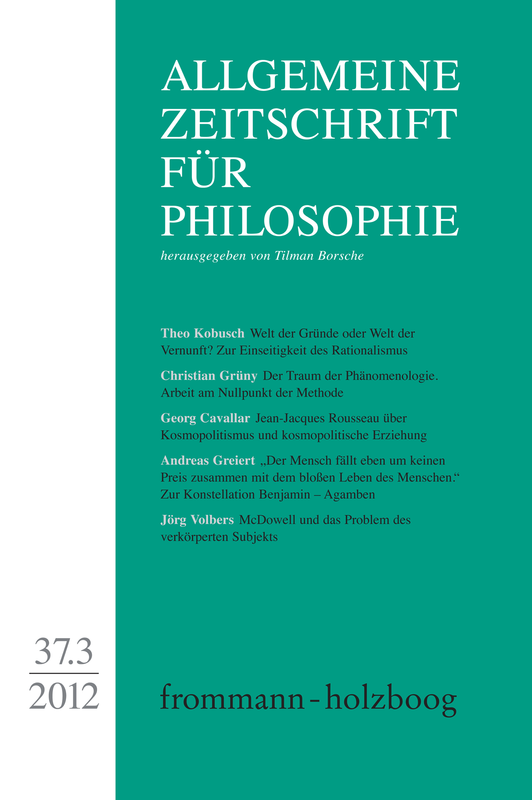 With contributions by Georg Cavallar, Andreas Greiert, Christian Grüny, Theo Kobusch, Sergej Seitz and Jörg Volpers. This paper tries to show that Western conceptions of reason from Plato to Wittgen stein have always included a consciousness of the conditionality of one’s own standpoint. This consciousness of standing on a certain ground and of having been born and raised into some historically grown convictions is traditionally called belief or trust. This form of belief is an inextricable part of reason itself. This is shown with regard to the philosophy of Plato and the Christian philosophy of the church fathers in antiquity, and to Kant, Jacobi and Wittgenstein in modern times. Contemporary rationalism (Brandom, McDowell), however, tries to dissolve this standing in a certain historically conditioned universality which requires reason in order to be perceptible at all into a purely rational thinking. Nietzsche’s description of the Apollinian world of dream exhibits a striking similarity to the view of the world in Husserl’s transcendental reduction. Starting with Nietzsche and Schopenhauer, the article deals with the particular transformation the world is subjected to in this change of perspective or attitude. In a detached observation certain dimensions of experience that depend on active participation undergo a fundamental change. After all, our entanglement with the world cannot be completely undone. Phenomenology, too, needs to assume a stance and produce (re)presentations, but Husserl’s radical claims tend to under - mine any consolidation of concepts and constructions. Breaking with the habitual and familiar is the methodical degree zero phenomenology keeps returning to. Traditionally Rousseau has been interpreted as an advocate of modern nationalism and nationalist education. This article tries to show that Rousseau defended a form of civic patriotism, which is in principle compatible with genuine moral as well as republican cosmopolitanism. While Rousseau attacked several forms of cosmopolitanism espoused at his time, such as commercial or natural law cosmo politanism, he himself developed a kind of »rooted cosmopolitanism« (Appiah) which tried to strike a balance between republican patriotism and legitimate forms of cosmopolitanism. A careful reading of Émile shows that this is a book about the formation of a moral and cognitive cosmopolitan who avoids the deformations of commercial society. The article critically discusses Giorgio Agamben’s reception of Walter Benjamin who figures as an important reference for Agamben’s assumption of an inevitably totalitarian nature of all (state) sovereignty. Agamben’s diagnosis of a successful reduction of human beings to their pure life is drawn, after all, from Benjamin’s essay on the »Critique of Violence«. A close reading of Benjamin’s text within its historical contexts, however, leads to a revision of this interpretation. Agamben’s anachronistic reading withholds without notice crucial contents of Benjamin’s conception of ›pure life‹, and thus distorts Benjamin’s argument. In identifying rationality as belonging to our »second nature«, McDowell’s specific form of naturalism aims at reconciling the reflecting subject with the world. The detailed exposition of this idea in Mind and World, however, operates with two conflicting claims. While arguing for the bodily nature of subjectivity and thus disagreeing fundamentally with Kant’s transcendental conception of reason, McDowell still retains the central Kantian claim that thinking is an autonomous and self-standing capacity. The article argues that the bodily nature of subjectivity (even within the framework of a ›relaxed‹ naturalism) does not allow for the strong Kantian idea of autonomy. Taking McDowell’s revision of Kant’s transcendental framework to its conclusion requires to go beyond the concept of innate rational capacities. Rather, thinking should be seen as being operative in material practices. Sergej Seitz: Andreas Hetzel, Die Wirksamkeit der Rede. Zur Aktualität klassischer Rhetorik für die moderne Sprachphilosophie.